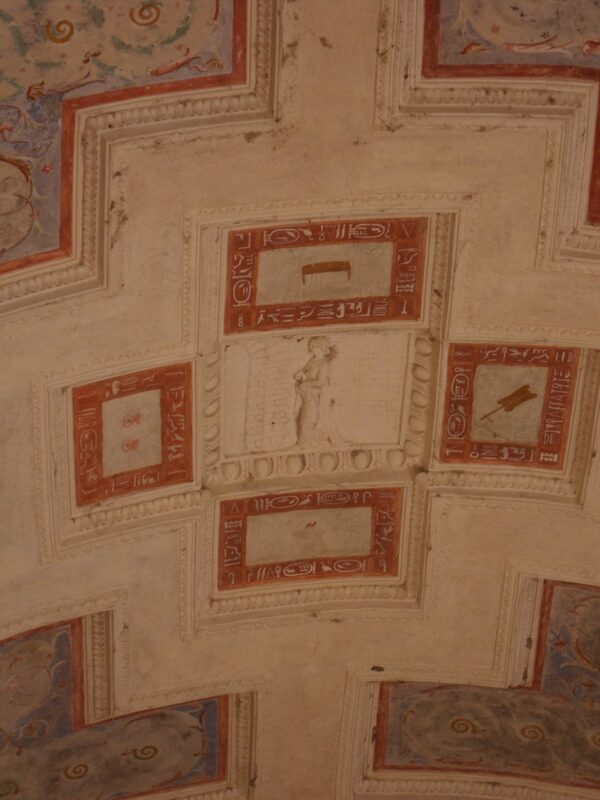 A decorated roof at one of the palaces in Mantua. Franks in the Middle Ages usually took the same inclusive view of the pre-Christian past. Lists of the Nine Worthies had places for Christians, Jews, and pagans, Boccaccio drew exempla from Justin’s tales about Artaxerxes I defeating the schemes of the murderous chiliarch Artabanus, and the English decided that they were descended from the Trojans. This does not mean that they were not full of prejudices against foreigners, but in a world where Europeans divided their neighbours into “Christians, Greeks, and heathens”, pagan Persians did not necessarily seem more exotic than pagan Athenians or Jews who disagreed whether the messiah had come. This small-town newspaper accepted that ancient Babylonians and medieval Europeans were both people, who under similar circumstances could develop similar institutions which could be studied both as institutions and within the context of a particular place and time. It did not assume that they were from two incommensurate and alien civilizations. It may be that secularization in the late 20th century, and the decline of forms of Christianity which encourage broad and deep knowledge of the Bible, created the climate where some Europeans and European settlers could convince themselves that their only cultural ancestors were Greeks and Romans and that their civilization and Near Eastern civilization had nothing to do with one another. Even now, plenty of Americans are enthusiastic about Vikings and Norse myth. It does not take a genius to see that American culture draws on Greco-Roman traditions, and Jewish and Christian traditions, and Germanic traditions, and indigenous traditions from the New World. It does not take someone very clever to remember that Americans have been snatching at things Egyptian, Indian, Chinese, and Japanese in search of artistic inspiration or spiritual wisdom since the 19th century. The only thing which takes a slippery mind is overlooking these facts, and explaining away these uncomfortable details, and distracting an audience from seeing things which are before their eyes. And as we saw yesterday in Christchurch, slippery words about how only some people are really part of your community or your heritage, how other people should stay where they are while your people can move to their land and take it over, or how part of the common heritage of mankind is only safe as long as a pure and select group control it, these words are often pretexts for despicable acts. Can my gentle readers recommend some good books on this? Edit 2019-03-24: Peter Harrison, “An Eccentric Tradition: The Paradox of ‘Western Values’,” ABC Religion & Ethics 18 January 2018 (Wayback Machine) argues that “western values” and “Judeo-Christian” are hard to find in English books before the 1940s (the later dates back to Ferdinand Christian Baur, a Tübingen theologian in 1831 and was popularized by Friederich Nietzsche, but Americans often think they invented it in the postwar period) and that for most of the last 2000 years, western Europeans saw texts from outside their geographical and cultural world- Greek literature, the Bible, a long-lost pagan Roman antiquity- as the highest source of cultural authority. This post was written some time ago, and scheduled for posting a few days ago before events required me to add the second to last sentence. Dear Sean, I don’t if I can fully help You. I comprehend, that You are searching for some books, when modern European authors, thinkers started to think, to write, discusse how East is different from West and we are belong to the West, because from ancient times, our ideas, culture, history belongs to the West, which is radically different, unique. I’m pretty sure, that many works from at least 1990’s putting at least Greece into Eastern sphere of culture, history. Many things are acknowledged from East. Wlater Burkert – Babylon, Memphis, Persepolis: Eastern Contexts of Greek Culture has excellent brief survey. Perfect book about illusion of differences between ancient West/East ideas is Unthinking the Greek Polis: Ancient Greek History beyond Eurocentrism from Kostas Vlassopoulos. But this knowledge isn’t part of Czech education system (I mean elementary, high school). Our text books starting in many themes from Greece, Rome. If I think about history, medieval, renaissance authors don’t think much about East. For an example Machiavelli says, I don’t know these things, I don’t care. William Gibbon is first important author to divide world between East, West, but for him, these spheres are changeable! It matters on cultural level, sometimes was West hopelessly backward and poor against East, so the higher civilization was elsewhere. Greece, Rome somehow overruled imagination of artists, theoreticians, scholars. Try E.M. Butler The Tyranny of Greece Over Germany. I think it was continous process at least from 18th century. There were some fashion waves like Egypt, China history in European enviroment (I can look for many French authors from 18th, 19th century fascinated by China as better part of world!). My thesis was more about, how Hellenistic history (4th-2nd CE BC) was declassed as weak, unimportant compare to Rome’s history legacy for Europe, how this era belongs to the East history and Rome belongs to the West. But when I did comparation, analysis, our contemporary society is more Roman, than Greek, which is in economic, cultural, political level step back. Roman supremacy in law, military etc. this is hard for me too, because in Canada we do not have the concept of “western civ” which is popular in the United States. The American version of this story tends to go from archaic and classical Greece to republican Rome to Charlemagne’s kingdom to 18th century Britain and France to the 13 colonies, and quietly excludes Israel and Judah, pharonic Egypt, the medieval Romans (Rhomaioi) who could actually read and write Greek .. from “the west” (it does not have a lot to say about places like Czechia or Hungary either) A book by Geoffrey Parker classes Russia (but not the Ottoman empire!) in 1650 as part of “the west” so it can boast of how much of the world “the west” had already colonized, then excludes Russia from “the west” after the Bolshevik coup (apparently being taken over by people pushing ideas from Germany, France, and Britain made Russia less western?!?) This version is very widespread in American popular culture and quite a few Americans with PhDs like Samuel P. Huntington make use of it, but I don’t think it can survive even a gentle Socratic questioning. Because the people who use this idea don’t explain their thinking, it makes me very confused. It is not just about east vs. west, settled city-dwelling grain-eaters in the plains vs. wandering truffle-eaters in the mountains, citizens who pay taxes and serve in the army vs. barbarians who refuse to be controlled, that kind of thinking is everywhere, but about a specific definition of “the west” which counts back to Archaic Greece but no further, and claims that a handful of countries are the only true heirs to that tradition and that there is no need to study the rest of the ancient world. It is a very good point that Greeks have often been positioned as the Other! Whether Roman jabs at Graeculi, or Oswald von Wolkenstein’s “Christians, Greeks, and Heathens,” or the idealists who travelled to Greece in the 19th century and found a poor land of shepherds and farmers and human beings not moral abstractions from a speech about the Glory That Was Greece, or Samuel P. Huntington’s decision that 20th century Greece was part of Orthodox Civilization not Western Civilization. But that is one reason why I want to know where the family tree from Greece to Rome to Our Glorious Selves comes from. I have to agree on some points, I’m sure, that not just in Czech Republic, but also elsewhere is great deficit of knowledge about “others”, not just in antiquity. It’s very unfortunate, becase we have the knowledge in Czech about this. For an example, uniqueness of ancient Roman law. Aristotle Constitution of Athens has many great human, modern values. Hittite laws are more advanced in many ways than Romans or other contemporary and previous Near Eastern cultures. Notion of polis, democracy, students at Law Faculty are studying, that city, “military democracy” is existing concept (sorry, well documented) from Gilgamesh. So Greece isn’t so supreme or first. But students of history, or different faculties don’t know this, which is shame, not to mention elementary, high school level kids. Czech guys from Egyptology have many sources on early dynastic Egypt, proves that pharao wasn’t so all powerfull and people weren’t his disposable slaves. But the right information aren’t always part of wide circulation and public space! And that is the problem. Details like, we have evidence for functioning of Phoenician city states from 1100BC onwards which are predecessors of Greek poleis are regretably missing from most of our school sources. It’s not part of our knowledge and thinking in wide sense. That pains me, but there are some doves of peace and spring swallows. Even if You propably don’t like Tom Holland (at least Jona Lendering is perplexed by him, and I get it why) he has interesting points about Sassanid Empire (book In the Shadow of the Sword). He describes this “Eastern empire” with modern parallels, connotation, like radical people movement from below, democratic elements, socialism… And this guy is popular, so even Czech readers could be drawn more into this and throw away concepts like old, unchanging Eastern society, history which has nothing to do with West. Regarding the family tree, why are we West, where is the line of evolution, I think it’s clear. Graeco-Roman antiquity thinkers – Hippocrates corpus, Aristotle (because relativist like Eratosthenes didn’t survive intact). Even military thinkers like Polyainos are operating in binary code West/East, Maurice’s Strategikon goes in the same way. Medieval era is seen as an attempt of culture without influence of antiquity, but ancient sources and concepts were widely used. Kings were looking for family trees from Trojan war, not just Bible. Then You have Italian renaissance, influx of Byzantine books. In modern era You have direct citations about antiquity in French revolution movement, or fascination about Romans in Napoleonic regime. Plutarch is authority there (his Lives were an example, funny thing that from that age till today almost everyone believesm that Phocion was good and Athenian democracy rabble:) No he wasn’t good, I can recommend book about this theme. But all this isn’t such problem, problem is, that average Joe, and even participants of higher education don’t have sufficient knowledge of the World, global history. For an example, students of Political sciences here don’t know Arab medieval thinkers, Mali empire history, other Africa history, or they are absolutely clueless about China, Japan, India history. Latin America is little better, but still it’s unknown territory. These debts will be perhaps one day repaid in full, but it will takes lot of time I think and effort. Bonus, Russia wasn’t meant as Europe, West till 18th century and Sweden geographer Philip Johan von Strahlenberg made map for Catherine Great on her command, look till Ural we are Europe, because I need influence and I want Russia as European power. Before then, Ukraine is a border of Europe, many French thought in 18/19 century oh Poland, that’s is not Europe. I don’t mention Czech, Hungary, Baltic states and Balkan states. But there were reasons for this, Ukraine is border of Europe/Asia from Antiquity, Turkey or Asia Minor was always an East in European thinking. One of the reasons why I want to release book about Assyrian (I’m writting it), Persian warfare (I have sources, themes prepared), is, that everyone firmly belives in Roman military supremacy of all ancient times. It’s common knowledge here, Roman law and military is supreme, that’s their reason of success, or nonsense like they were more advanced civic society, than contemporary/previous states. But most people don’t know a thing how impressive these “Eastern” people were and how they reached level of military excellency fully comparable with Rome. I’m not specialist for Assyria, Persia, but here nobody is doing something, so I have to step up. And after these two books I can full indulge myself into Hellenistic era (book about Xenophon is under editor review, my translation of Polyainos should be released soon). Pperhaps one day I write book with name Fall of Roman Empire as military problem. Again it’s not my theme, yet I read several new and old books about late antiquity warfare (around 40), so I know something. But this theme was quite mistreated here in one recent book from 2016 https://www.kosmas.cz/knihy/219964/pad-rise-rimske-rimske-valky-v/. Concepts like military power of Rome was gone after 410 A.D. kicked me out of chair, and there were more problematic points. But author is popular indepent historian, he’s got connections with publishers I have not. Nobody wants to release some real study of problems, they are interested in big synthesis stories, or very simple retelling of primary sources. Yes, in this enviroment I’m dying and living. Mrs. Tsenhor Djekhy & Son. Not a word here, what a sad world. I would like to read Persian Fire, I remember liking Rubicon but that is an easier book to write, just reading Greek and Latin literature and comments by classicists and archaeologists. It is strange that every few years another book retells Herodotus 7-9, or Thucydides, or Procopius and people buy it. Maybe it is sort of like cookbooks and craft books- people want to buy ‘a book’ on the subject, and they don’t really care whether it is the best? Or bookstores hope that this book will be one which sells well, whereas they know that the last one did not? I don’t know why the books which sell really well are the ancient historians talking about how best to occupy Iraq, or the neuroscientists talking about world history, or the psychologists talking about everything in heaven and earth, and not asking one expert for advice and listening to it. When experts write about something they know something about and that ten books don’t already say, like Empires of the Word or The Horse, The Wheel, and Language or John Lynn’s Battle, they can make OK money but not lots. I will be attending Citizenship in Classical Antiquity: Current Perspectives and Challenges if its still possible to visit London in July. I got one citation to Ibn Khaldun in my thesis and the chapter on Achaemenid armies which is waiting for the editor.